also be a source of great danger. Play it safe with these forklift safety tips. Before each shift, examine forklifts for safety purposes. Avoid operating a vehicle that requires maintenance or repair (which should be provided by the respective qualified experts). Inform the shift supervisor of any identified issues, problems, questions, or concerns. Forklifts operate uniquely; since they steer from the rear, the back of the vehicle needs a wide sweep to turn. Never leave an operating forklift unattended. In fact, leaving keys in an unattended forklift (or, thus, leaving on the ignition of this vehicle) is illegal, and has dire consequences as a safety hazard, even without the actual occurrence of an accident. Know and never exceed the lifting capacity of the forklift. Forklifts must follow designated roadways at the work site. Work-site rules and regulations must be adhered to. Keep hands and feet away from the cross members of the mast— should the mast be lowered and catch your hand, you’ll suffer from serious injury. Forklifts need to be refuelled— after, of course, they’ve been turned off—at designated and well-ventilated locations. Forklifts which are not in use should be carefully parked, with the parking brake applied. As the operator of a forklift, you must receive thorough forklift safety training and certification before being entrusted with the heavy machinery. Avoid hazards on the floor; slippery or unstable surfaces, bumps, holes, etc. Direct your forklift forward when driving up ramps, but go downhill in reverse. Don’t load/unload on the ramp. Alert others of your coming with a horn or your voice. Stop only when you have enough space to pause safely. Note any changes to your operating environment. Ensure that you are in complete control of the vehicle. Stay in the operator’s seat, and keep your body within the frame of the vehicle at all times. Wear your seat belt for protection case the vehicle topples; if that’s the case, the frame will offer sufficient protection (along with the seatbelt!). Never allow unauthorized people to drive or otherwise operate the forklift. Never operate with wet or greasy hands or shoes. You could easily slide or slip and cause an accident. Remember to inspect the forklift daily, before every shift; never operate a forklift with issues or in need of repairs. Forklift operators must be trained, examined, and certified. Know the forklift capacity and never exceed it. Secure and stabilize loads; drive carefully and slowly; and ensure visibility. Always take extra precautions for the people around you. If you’re driving, always keep an eye out for other people around you, especially those on foot. Avoid fast moves. Always drive, stop, turn, and lift or lower the forks slowly and as smoothly as possible. 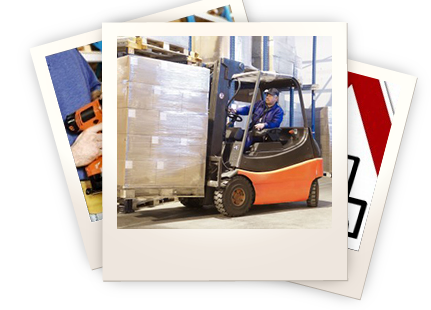 Sudden turns can toss off a load or even the entire forklift off balance, which make it a much greater hazard for the operator and especially the surrounding people. Be especially careful when navigating ramps, inclines, and grades. No one should be allowed to stand or walk beneath or upon the forks, whether they’re emptied or loaded. Most accidents with forklifts occur by plummeting loads which crush the person below. Place loads back by the mast, where they’ll balance most stably; never place loads at the front of the forks. Never load trucks beyond approved capacity. Always travel with the forks positioned as low as possible for increased stability and protection. Never travel with forks that are elevated and/or tilted forward. Ensure that the load is stable or strapped in place before moving the vehicle. The load must be balanced on both forks. Avoid decaying, warped, or otherwise damaged skids and pallets. When stocking, be vigilant for slipping, unstable, or toppling loads. Have a good view of and easy access to the rack or location where you must position your load. If your load obstructs your view, operate the forklift in reverse to improve visibility and operation control. If visibility remains obstructed, enlist the help of a lookout or helper to guide you between obstacles and people.